The purpose of the book is to offer medium and meeting point in prints, soft copies and now online where desiring Nigerians and the rest of the world refer for verified information for their marketing, purchasing and research purposes in the Building, Construction and allied Industries in Nigeria. 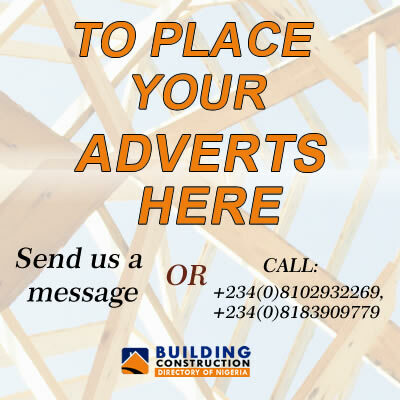 Stake Holders (Businesses in the Building, Construction and Allied Industries), Architects, Quantity Surveyors, Building and Civil Engineering Contractors, Property Developers and Managers, Electrical and Mechanical Engineers, Consulting and Structural Engineers, other Engineers and Professionals in the Building, Construction and allied Industries in Nigeria and Internationally. Corporate Organisations, Private Businesses, Embassies, Government Agencies and desiring Nigerian Public .to mention but a few. They use the book for their marketing, purchasing and research purposes. While every care has been taken to ensure accuracies of information contained in prints and online, the publishers do not accept inaccuracies, errors and omissions which may unavoidably occur in publication of this nature. The publishers wish to express their profound gratitude to our numerous subscribers and advertisers whose patronage has kept this publication going for more than a decade.